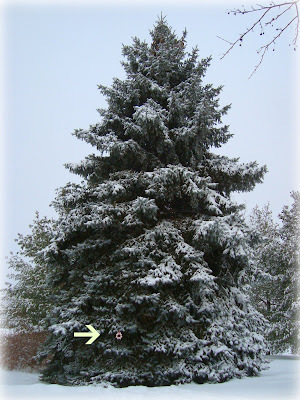 This is our huge Christmas tree in our front yard. It's the tallest Blue Spruce I've ever seen! It's my favorite spot for my ornament photo shoots. I spy a wreath in the snow! I was snowed in with the children for the second time in a week! Loved it! I won't tell you how long we stayed in our pajamas... it was snowing too hard to go outside for most of the day. What to do? Perfect opportunity to make some more gifts. 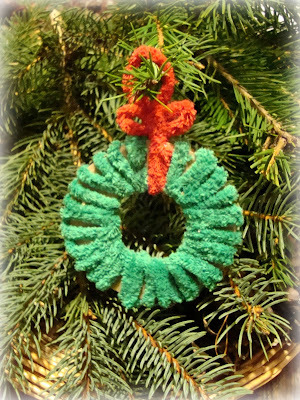 We made four different versions of a wreath ornament. Three of them are perfect for older children or with an adult's guidance. The fourth wreath, my four year old taught me how to make! 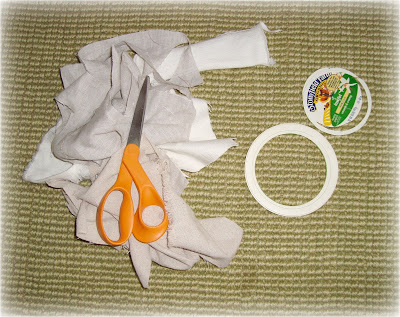 None of these require fancy supplies or sewing skills and we recycled. Hope you have fun, we did! 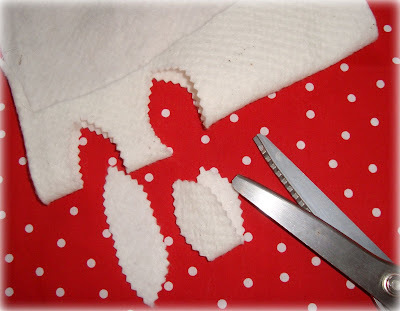 - cut out leaf shapes on the fold of your fabric. I was planning on using felted sweater scraps, but then I saw all of the natural cotton batting left-overs from my buckets... they work just like felt... maybe better as far as glue is concerned! "That's not how you make a wreath", my four year old told her ten year old brother and me. According to her, real wreaths are green and made from "wire" and cracker boxes. It took me a second to figure it out, but I had seen several children making these at her school. 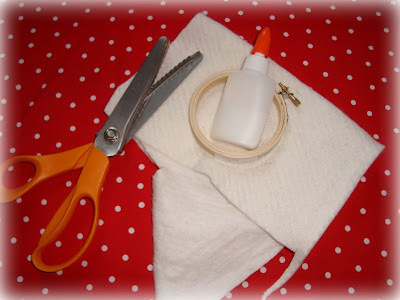 - finish off with the red one and make a loop for hanging and optional bow. Hope you have fun making and celebrating this weekend! All of your ornaments are just perfect! I just love the materials you used--I had never thought of using cotton batting as felt (it looks so organic and natural!!) 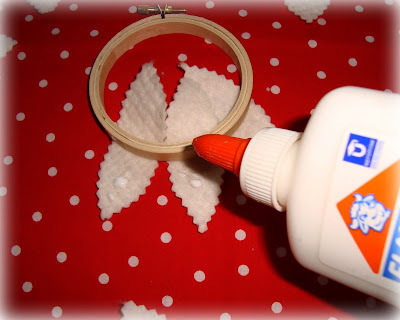 or a yogurt lid to make a wee wreath like that. 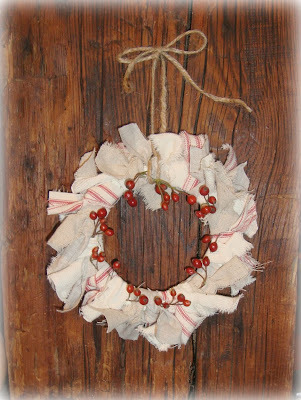 I love the natural colors of the linen that you used on the wreath, with the red ticking fabric as a nice contrast. I think we have a nice crafty weekend ahead of us to fill in some of the spare spots on our tree! With maybe some gingerbread people to fuel our efforts. Haha, I just had to laugh at the "That's not how you make a wreath" part. I really like how the rag wreath turned out. It's much better than what I imagined a rag wreath would look like! Maya, If I did not have to go out yesterday I would still be in yesterday's pajamas! 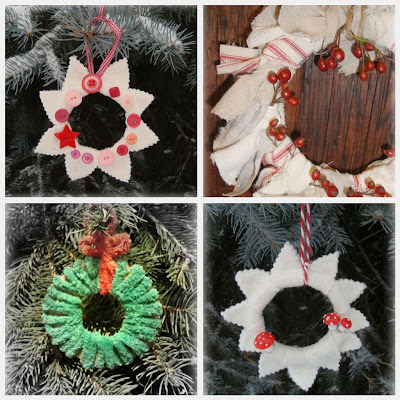 Very fun wreaths, I had planned on making a large one with scraps from all the sweaters I have upcycled into presents but have not had the time. Of course I was thinking a large one so this idea (the rag style)is perfect for me to still be able to play on a smaller scale. Oh those look like fun! 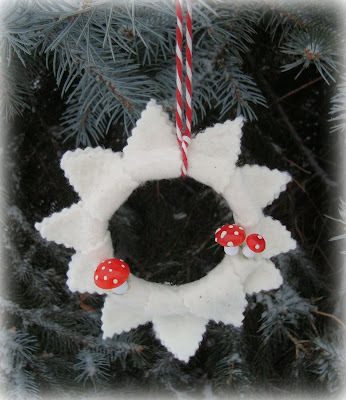 I've actually been planning on making a couple of wreath ornaments with my girlies. Thanks for the ideas! Wow, what a beautiful spruce! The ornaments are beautiful . Great idea! Ooh, the rag wreath. Must try that someday. What a fabulous strong tree! Thanks for giving us some perspective. I love the rag wreath! It actually has a very French look! The red-and-white fabric is a classic in French kitchen and table linens. Really nice and a great idea!! 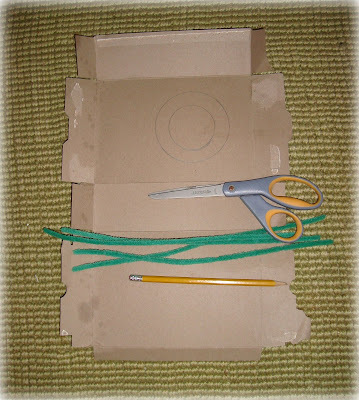 Keep up the wonderful recyling and green ideas! I'm in such envy. Getting snowed in with the kids and crafting together. I miss having kids around. You live a lovely life there, Missy. Great ornaments! I see the tiny wreath in the enormous tree. Very big and beautiful. 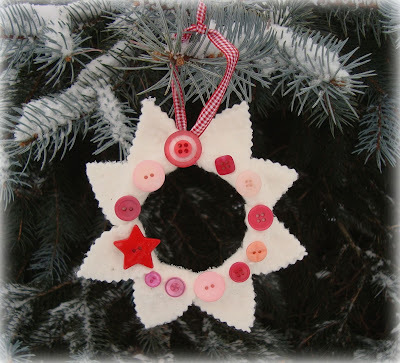 I found you over at The Crafty Crow, and I'm so glad I did - these wreaths are so cute and simple to make! What wonderful simple gifts!!!! love them all, and love that you have options for all ages!!! Thanks for sharing!!! I especially LOVE the rag wreath! Love the wreaths! Thanks for sharing! This will definitely be something my girls will love to do. Great blog! 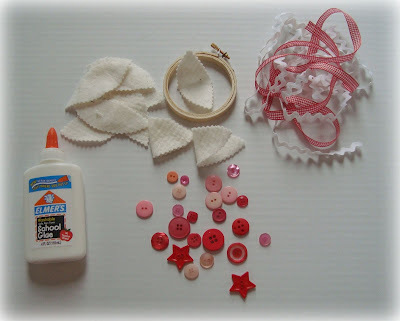 I love that you re-use materials, like the yogurt lid rather than a nice embroidery hoop and of course cracker boxes. And they are wonderful crafts! Thank you for sharing!! 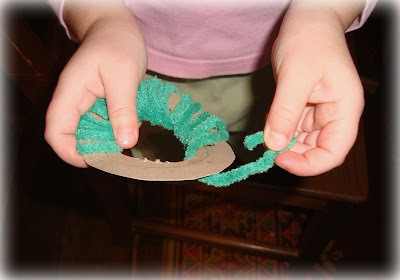 I love the cloth scrap wreath. Simple and elegant.